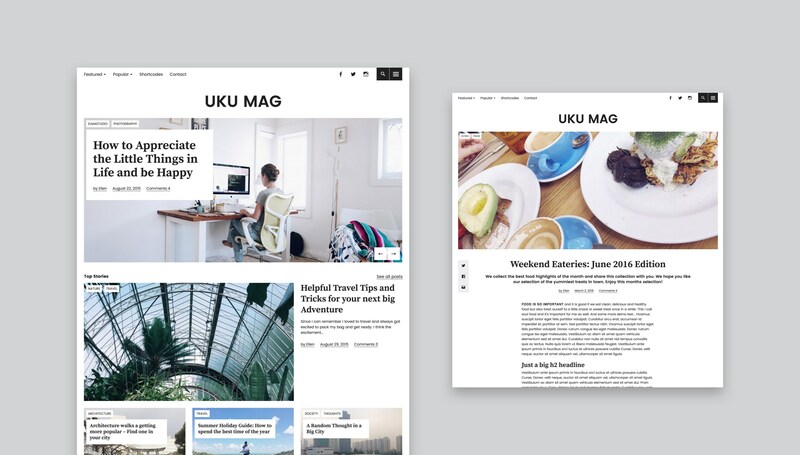 Our Uku WordPress theme gets a new update (version 1.1) today. It comes with optimized theme options and some smaller CSS optimizations and bugfixes, but the best part is a complete new design style option. Now you can choose between the “standard” design style and the new Uku “neo” design style in the theme options. The new style has a fresh, open design. It uses a serif font for titles (the Source Serif Pro Google font). All other text styles use the modern, fresh looking sans-serif font “Poppins”. Most titles are shown on a white background in the Uku neo design style, which brings a light feel to the theme. The Overlay area (viewable via the menu button) is a fullscreen area in the new Uku neo design style. Next to the website title and description text is shows your main menu and an optional Off Canvas widget area. 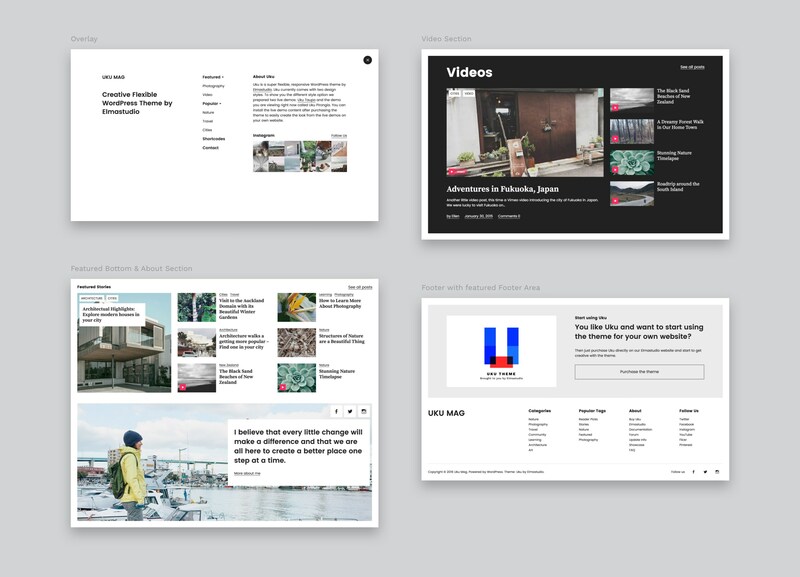 The Featured Sections (Top and Bottom) both have a little bit different layout and the Front page About area has a fullwidth image and right-aligned text on the image. Both demo files are available to you in the main theme folder (or in the demo folder for Theme Bundle users). So you can import the live demo data and use it as a starting point to build your own website with Uku. You can of course also use all the images we included in the demos. In addition to the new design style option you can also choose to hide the sidebar on single posts or on the Front page only. To hide the sidebar on pages individually, you can choose the “No Sidebar” page template. You can now also include small CSS snippets directly via the Theme Options panel (under General). We hope you like the new, second design option for Uku as well as the new live demo. We would love to hear your feedback and suggestions for Uku theme optimizations. We are excited to hear your ideas for new theme features and options and we will try to include all your suggestions into theme over time. Just write us a comment! Please let me know, if you have any further issues or questions regarding Uku! I’m so sorry that you are experiencing difficulties with the images in the theme. Can you let me know, which browser you are using and if you are maybe not seeing the same issue using an alternative browser (this way I could see, if it’s a browser related issue). Gerne würde ich mich erkundigen, inwieweit man die Stile der beiden Demovarianten verknüpfen kann. Ist das relativ einfach über CSS möglich? Ferner, steht schon fest, wann die dritte Demovariante veröffentlicht wird? Ist geplant, dass man die Startseite zB im Rahmen eines späteren Updates flexibel gestalten und die einzelnen Blöcke nach eigenem Gusto anordnen bzw. bei jedem Block das Blockdesign auswählen kann (feature request)? Und da Du oben schreibst, dass das Theme noch um weitere Features ergänzt werden soll… kannst Du da schon aus dem Nähkästchen plaudern, in welche Richtung das gehen wird?